And, let me be the first to say that not all dog trainers are created equally. Here’s one of our team trainers with our latest video on fixing your dog’s anxiety around other dogs. The dog training world has been going through some interesting changes in the past 40 years. The face of professional dog trainers has certainly changed. I can’t tell you when the last time I went to a dog training appointment in high heels and a tight suit or the last time I yelled “shhhhhhh” while I throat punched an aggressive dog or alpha rolled him (both are never, btw). The truth is that neither of the aforementioned examples were actually dog trainers. We live in a society that wants a pretty face or a “personality”. I would probably make a horrible TV face of dog training, because I am more about getting to the actions and lessening the drama. Good dog training should be a mixture of a balance of training. Again, there are a million dog trainers. Get a new puppy and your neighbor becomes a dog trainer too  but there are a few basic “ways” or techniques that have been developed over the last 50+ years. 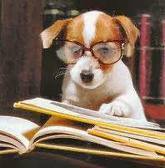 First let’s understand, briefly, the changes of dogs in our society. It helps to understand why all the changes to dog training have been going on in the past few years. Originally, in the beginning of time dogs were domesticated and served a purpose. Dogs pulled carts, dogs guarded flocks and families and had jobs. In order for the dog to survive, the dog had to have a purpose to the family or the community. This help us to develop better workers and dogs that were more truly “domesticated”. Training a dog was giving it a job most were taught through physical correction and punishment and most weren’t brought in the house, they were more “stock” animals like horses, cows, etc. As time developed and people needed the job of the dog less, the dog was brought in (many small dogs) to be companions and therefore even more “domesticated”. Training a dog was completely different. Of course, eventually we humans realized how much we enjoyed canine companions and we began specific breeding for purpose and categories and breeds of dogs developed it just took a little time. Those are just the basics, there is a lot more history, but that is for another article. I just want to note that dogs of the past were harder dogs, the labradoodle of today would probably have had a difficult time with survival 100 years ago. Dogs have changed and so has dog training. In early 1900’s, dogs began being trained for war dogs and as police dogs, punishments ran rampant as a training style. Again these were hard dogs, they worked hard, they bit hard and their temperaments were not as “domesticated” as you might be used to today. Punishment was a way of life for these dogs. Training your dog was different. We didn’t have the benefit of science. In 1935, the AKC (American Kennel Club) developed dog obedience trials. And William Koehler, who had served as principal trainer at War Dog Training Center in CA developed a training program and published a book, The Koehler Method of Dog Training. Dog training hit mainstream for the basic owner or family using physical corrections and punishment. Choke chains, leash corrections, throw chains, shake cans and all kinds of punishment dog training techniques hit the masses as the only way they knew to train a dog. When your puppy had an accident in the house, rub his nose in it as a correction; this was solid potty training advice. Often the owner was to wait for bad behavior and then correct it. Physical corrections, spike collars (yes they existed back then), and forced compliance with the leash was the way to train. If the dog didn’t comply, he was forced to do so and usually in a very brief period of time. These methods are still used in many military and police training programs. Punishment is still often a way of life for these dogs. And, although dog training was difference and has drastically changed along with modern dogs, I will admit that these techniques were effective for decades (I’ll admit to reading the book). It is important to note that BF Skinner https://en.wikipedia.org/wiki/B._F._Skinner and Konrad Most’s (who developed training for Guide Dogs for the Blind) research on animal psychology and operant conditioning are continued to be utilized in both human psychology and even basic and positive animal behavior training. These guys were well known for using both reward and correction to learn more about animal behavior. But leash corrections were still being utilized for dog training. In the 1980’s or so dog training techniques and styles as a whole began to separate. As did dog ownership. Not nearly as many people were looking for guard dogs, more were looking for family companions and a well behaved dog. Dog trainers like Karen Pryor a marine animal trainer and developed marine animal shows published her first book in 1984 “Don’t Shoot the Dog: the New Art of Teaching and Training” and Ian Dunbar a veterinary behaviorist went head to head on training techniques and the rules of conditioning like positive reinforcement with trainers like the Monks of New Skete, Blanch Saunders (who was known for using harsh choke chain corrections) and other trainers who used more harsh methods. Positive reinforcement and conditioned reinforcers like clicker training were gaining ground! 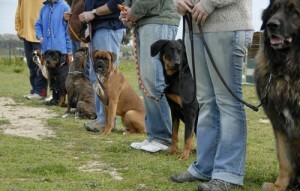 These trainers were more focused on teaching your dog by rewarding and conditioning good behaviors. The way to train your dog was changing. Professional dog trainers were changing and a war was about to begin. Puppy training, potty training, working with aggressive dogs was all being successfully conquered by these new trainers and their new (although old) science and techniques, show casing positive reinforcement. But old habits die hard! Many older trainers had a hard time with change and exchanging their choke chains, leash and shock collars for treats and a clicker and waiting to capture behavior. They preferred punishment and thought of it as an actual training technique. The Koehler method of obedience trainer would have you put on a choke chain on the dog or puppy. Command “Sit” in a very commanding voice and then yank up on the choke chain while forcing down on the hips which is punishment. After a period of time and some corrections later the dog will associate “Sit” with the behavior you desire and hopefully choose to avoid punishment. 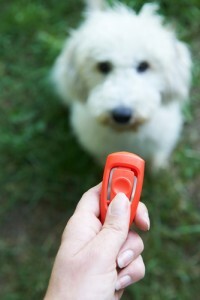 The positive reinforcement method of obedience trainer would first have you load your conditioned reinforcer (or clicker) https://thedogtrainingsecret.com/blog/basics-started-clicker-training/?_ga=2.1325553.1597687708.1545763128-1109997244.1510435676 then you would wait for the puppy to sit naturally, click and reward. This type of training is called capturing. 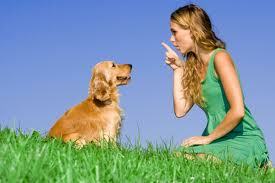 You are teaching the animal that if he shows the right behavior he will be clicked and rewarded. Or, you can use a treat and lure the puppy’s front end up until his back end hits the ground then click and reward. Once the behavior is fairly consistent (meaning the puppy is doing it several times in a row) you would add the command or the verbal cue “Sit” and tell the puppy what it is doing. The first group (old school) would argue that this kind of positive training took too much time and would never be effective on aggressive dogs or anywhere outside of basic obedience. The second group (positive reinforcement) argued that if you could simply reward good behavior (conditioning) that your dog or puppy is already showing that you could literally avoid bad behavior and most aggressive (that was brought on by the conflict of the physical pain) and potty training would become easier because the dog was more attentive and chose to spend more time around his owner. Luckily, I have seen the science, which has thankfully been immense since the times of BF Skinner the forerunner of positive reinforcement! I know I fall on the side of positive reinforcement and have seen the problems from old style training methods and punishment. 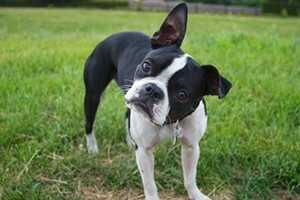 Why add a verbal cue until the dog understands and is showing the behavior? When I was young (in my early 20’s) and impressionable I worked for an organization that was training Service Dogs in a prison. This was the first of my experience of working with dogs this highly trained. Once night a firefighter was brought in to teach the prisoners and us trainers how to communicate to the dog a “forced retrieve”. I had literally never seen anything like this and I remember being excited to teach a dog such a skill! The man put the dog on a grooming table where he could tether him down, took out a key and an item and explained how he was going to use the key to get the dog to take the item. Interesting!! Until I watched him command “Take” as he dug his key into the dog’s ear pinnae until he screamed at which time the item was forced into his mouth and the key was released. Within a few minutes, this soft sweet dog that didn’t want conflict was feverishly seeking the item. Fear and punishment is a horrible way to be trained to do anything. Imagine someone cutting you until you showed the right behavior, which you didn’t understand because you couldn’t communicator with the cutter? A few months later I moved to Colorado and got involved with another Assistance Dog organization that trained service and guide dogs. They introduced me to the method of using a motivational retrieve. After all, as they mentioned, what disabled client could deliver that kind of “correction”. I was taught to click stages of rewards and jackpots from looking at the item to finally taking it to retrieving giant objects from great distances. I taught one of my shelter dogs to roll a wheelchair on its side and drag it over to it’s owner if he/she was to have fallen out of their chair; it made for an amazing demonstration and I can tell you I would not have achieved that success from pinching his ear… that would have required me to be close which kind of defeats the purpose. I have seen the two sides. I have trained both ways, to some degree; I have found some balance. 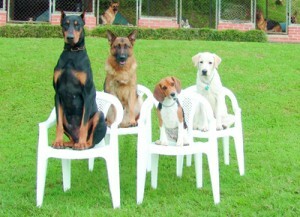 Lack of balance is where we have gone crazy in the world of dog obedience training. We went into a world of “purely positive” trainers which in my opinion doesn’t exist (nature is one of the harshest teachers of all) nothing is purely positive without correction. Unfortunately this leads to a world full of wild dogs who have no real training or proofing. If the dog doesn’t obey what is a dog owner to do except ignore it or be blamed. The problem is that these trainers don’t know how to function if the dog doesn’t behave, or the owners simply refuse to add anything that isn’t purely positive. It is difficult if not impossible to attain a well behaved dog this way! And, we seem to be swinging back to bringing prong collars and shock collars into the homes of young puppies. I literally know of a very successful training establishment in my area that normally puts prong collars on 8 week old puppies. The problem is that some of these dogs will grow up and threaten to bite their owners when they are big enough to feel that they could win the conflict. Fear is never the best way to train and often elicits an aggressive response eventually. But the second is more painful and more dangerous. And, today’s dogs are more soft (think the wild Labradoodle that will scream bloody murder if you even hold his collar wrong), yet more dangerous because fear and pain bring bites and aggressive responses. People are less good at reading dog behavior or dropping their phones to pay attention to anything but social media. We need to drop the drama. We need to stop putting TV drama in front of people and calling it dog obedience training! It is confusing to owners. On one hand you are going to get bitten, on the other you will own a 3 year old dog who literally has no impulse control or training at all and is stealing from your toddler and pouncing on grandma. Corrections don’t have to be hideous or painful or full of fear. A correction just means you have some way to ensure follow through. If a dog that I know knows how to “sit” but chooses not to do so in a fairly distraction free environment; I am not above some kind of correction. For my female that may mean crating her and taking my time away from her or dramatically putting her toys and treats away. She is a sensitive dog. For my male, I am not above a leash pop or using his pressure points, he is not a sensitive dog. I don’t need to rip his head off or yell, but he or she can’t be allowed to simply ignore commands. I try to be the best thing in the world for my dogs, I keep their treats and their toys and I reward good behaviors… but occasionally dogs choose to misbehave. A little follow through may have to be instilled for a short time until you can get the dog to willingly choose the behavior and be rewarded. Correction in this type of training is done for such a short period of time, most big trainers won’t even admit to it. Be we all have free will and sometimes you don’t want to do what you are asked, even when you know you should. It’s okay. I am still a positive reward trainer, I just believe in honestly and some follow through in dog training and obedience. Again, dog training has changed. We should be using our knowledge as the higher species to avoid as much conflict as possible while still maintaining some control. Just use your common sense and what works for your dog!